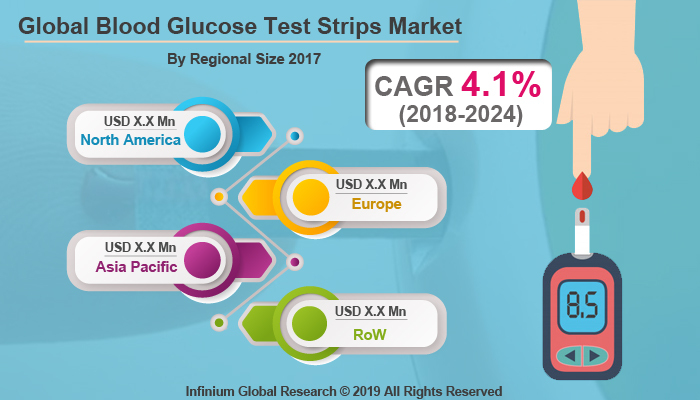 A recent report published by Infinium Global Research on blood glucose test strips market provides an in-depth analysis of segments and sub-segments in the global as well as regional blood glucose test strips market. The study also highlights the impact of drivers, restraints, and macro indicators on the global and regional blood glucose test strips market over the short term as well as long term. The report is a comprehensive presentation of trends, forecast and dollar values of global blood glucose test strips market. According to the report, the global blood glucose test strips market is projected to grow at a CAGR of 4.1% over the forecast period of 2018-2024. Blood glucose test strips are one of the main tools involved in monitoring and controlling glucose level in the blood. Blood glucose test strips are small and disposable plastic strips. Blood glucose test strips may appear insignificant, but play a very significant role in helping people who are living with diabetes in order to monitor appropriately and control the glucose level in the blood. In Type 1 and Type 2 diabetes that are the most common forms of diabetes and blood glucose test strips used to determine the level of glucose or sugar in the patient’s bloodstream. Blood glucose test strips identify periods of high or low blood glucose levels. Blood glucose test strips lower risk of serious diabetic complications as well as improves long-term glycemic control. The growing prevalence of diabetes mellitus drives the growth of blood glucose test strips market. The occurrence of diabetes is increasing owing to the aging population, family history, obesity, physical inactivity, poor diet, and certain ethnicities. Moreover, increasing awareness regarding health issues boosts the growth of blood glucose test strips market. Type 2 diabetes accounts for about 90 to 95 percent of all diagnosed cases of diabetes in adults. Increasing incidence of people with type 1 and type 2 diabetes coupled with increasing demand for blood glucose test strips. However, factors such as temperature, humidity as well as storage methods of the strips may hamper the growth of blood glucose test strips market. Advancement in technology provides beneficial opportunities for blood glucose test strips market. Geographically, North America dominates the blood glucose test strips market. Growing health concerns, as well as the availability of pharmaceutical hospital, boosts the growth of blood glucose test strips market in the region. According to the Food and Drug Administration (FDA) over 30 different blood glucose monitors cleared by the U.S. that are available to consumers. Ongoing research and development activities as well as government initiatives regarding diabetes fuel the growth of blood glucose test strips market in the region. Europe is the second largest region in the blood glucose test strips market. In the Asia Pacific region, China and India account for 109.68 million and 69.25 million diabetes patients respectively. The USA has more than 30.04 million diabetic patients. Rising occurrence of diabetic patients coupled with rising demand for blood glucose test strips market in the region. The report on global blood glucose test strips market covers segments such as technology, and sales channel. On the basis of technology, the sub-markets include channel technology and wicking technology. On the basis of the sales channel, the sub-markets include hospital pharmacies, retail pharmacies, and online pharmacies. The report provides profiles of the companies in the market such as PHC Holdings Corporation, F. Hoffmann-La Roche Ltd, Sandoz International GmbH, LifeScan, Inc., HMD BioMedical Inc., Beijing Yicheng Electronic Technology Co., Ltd., Universal Biosensors, BioSensors, Inc., TaiDoc Technology Corporation, i-SENS, and Bayer AG. The report provides deep insights into the demand forecasts, market trends, and micro and macro indicators. In addition, this report provides insights into the factors that are driving and restraining the growth in this market. Moreover, The IGR-Growth Matrix analysis given in the report brings an insight into the investment areas that existing or new market players can consider. The report provides insights into the market using analytical tools such as Porter's five forces analysis and DRO analysis of blood glucose test strips market. Moreover, the study highlights current market trends and provides forecast from 2018-2024. We also have highlighted future trends in the market that will affect the demand during the forecast period. Moreover, the competitive analysis given in each regional market brings an insight into the market share of the leading players.